In Site administration you can set up as many institutions as you wish. Institution administrators can only administer their users and their institutions but not make any changes to site settings. You can also use the possibility to set up institutions for different parts of your organisation to use different themes, have different default settings and / or authentication methods. You see an overview of all institutions that exist on this Mahara installation. Search: Search for a particular institution by its name and then click on the Search button. Institution: Institutions are listed alphabetically. Click the Add institution button when you want to create a new institution. Click the Edit admins button when you want to add or revoke institution administrator rights for an institution member. When you want to add an institution by clicking on the Add button on Site administration → Institutions → Institutions, you need to fill in basic information. You can change all the settings except the Institution name later on. Institution name: This field is required. It is the unique identifier of this institution in the database. It must only be one word without numbers and symbols. If you specify an expiry date for this institution, once the warning time for institution expiry has been reached, site and institution administrators will be emailed about this institution’s impending expiry. The warning time for institution expiry and the auto-suspend expired institutions options can be found in the institution settings under Site administration → Configure site → Site options. Default membership period: You can set how long users will remain associated with this institution per default. Choose an option from the drop-down menu and then specify the number of days, weeks, months or years. After this length of time, the users will be removed from the institution. Users will receive an email before this time reminding them that they will be removed soon. However, that does not mean that they will lose their account. They will still have that and be associated with “No institution”. Theme: Use the drop-down menu to choose the theme that you wish to use for this institution. All pages in that institution will receive that theme. When users from other institutions view portfolio pages that were created in this institution, they will see this institution’s theme on these pages. If Site default is selected, when a site administrator changes the site default theme, the theme for the users of this institution will change, too. You can install more themes in the theme folder on the server. Check out the community-contributed themes. If users are allowed to have page themes, these pages are not affected by theme changes. Mahara has a configurable theme. 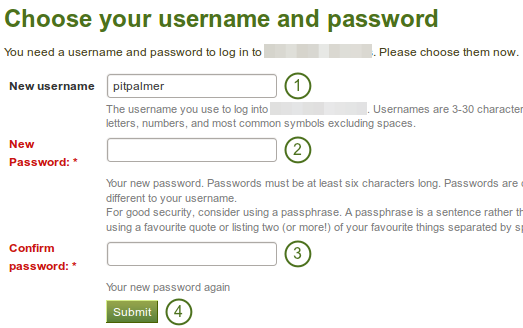 Locking profile fields such as first name, last name and display name can be beneficial for institutions that wish to always identify their users by their real names and not allow users to choose nick names. 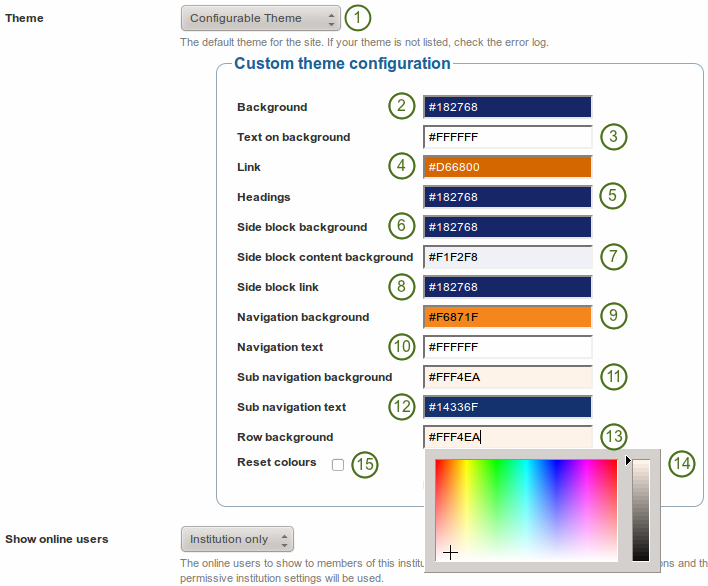 You can use the “configurable theme” directly from the institution settings page. In order to change any of the colours, either provide the hexadecimal color code or choose the colour from the colour picker that becomes available as soon as you click on one of the colors. Link: The link colour on any pages unless it is in the side block or navigation. Headings: The heading colour for all headings except in the side block. Side block background: The background colour of any side block. It should form a good contrast to the heading colour of the side block as that is always white. Side block content background: The color of the inside of a side block. Side block link: The color of a link inside a side block. Colour picker: Either type in the hexadecimal color code directly into the colour field or use the cross and arrow from the color picker to decide on your new color. BrowserID: user accounts are authenticated against a BrowserID. BrowserID is a project of Mozilla’s Identity Team. It allows people to have one login across multiple sites without having to divulge the password to these sites. All they need to log in to a BrowserID-enabled site is their email address. BrowserID has been renamed to Persona by Mozilla since it was introduced to Mahara. The protocol still works. We auto-create users: Place a check mark in this box if you wish to allow new users to register for your institution automatically using their BrowserID. Click the Submit button to enable this authentication method. The normal registration work flow and the potential confirmation of accounts does not come into play when you allow the auto-creation of accounts as this is an external authentication that is then considered to be trusted. We recommend you do not use the auto-creation of accounts unless you a sure that only trusted people can register. Otherwise, anybody with a BrowserID could register with your site. This option could be used when your site is only available in an intranet. If you want to use BrowserID authentication but do not allow the auto-creation of accounts, you need to create the user accounts manually or create accounts via CSV in the BrowserID authentication method. You need to register the users with the email address they use for BrowserID. The users can then log in with their BrowserID and do not have to worry about their internal username and password as their account will be associated with their BrowserID. Institution attribute (contains “…”): Enter the attribute that will be passed from the Identity Provider (IdP) that shows which institution the user belongs to. These usually directly correlate to LDAP attributes (the signin service of the IdP), e.g. eduPersonOrgDN. This field is required. If you deselect “Match username attribute to remote username”, you get an error message which talks about a config setting for “usersuniquebyusername”. Please refer to the experimental feature of the “usersuniquebyusername” variable for more information. 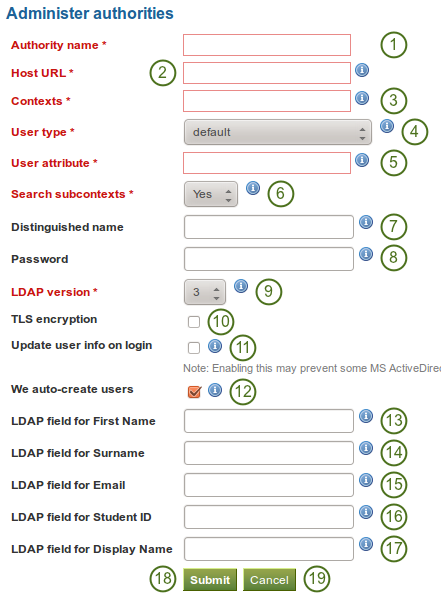 Use the XML-RPC authentication for connecting a Mahara instance to a Moodle or other Mahara installation for sharing login information. With Moodle 2 that does not only mean that you can log in to Mahara via Moodle, but also that you can transfer certain activities into your Mahara portfolio from Moodle. A Moodle site can only be connected to Mahara once no matter how many institutions you have set up. 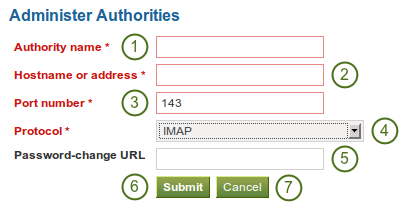 Every XML-RPC authentication instance in Mahara must have its own unique remote wwwroot, and must be associated with a single institution. Parent authority: If you set a parent authority from the already existing authentication methods, users will be able to log in using that authority as well as MNet. For example, you could set up SAML authentication and have that be the parent of this MNet authority. That means that users will be able to log in by clicking on the SSO login link using their SSO credentials as well as via MNet from their Moodle. You do not have to set a parent authority. 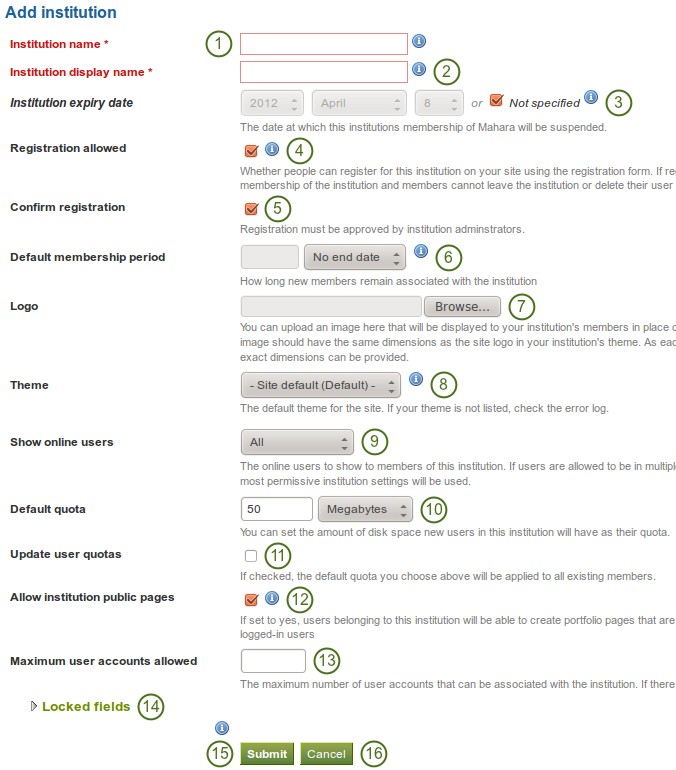 If you do not, users using MNet will only be able to access Mahara via MNet, i.e. log in to Moodle or the other Mahara first. 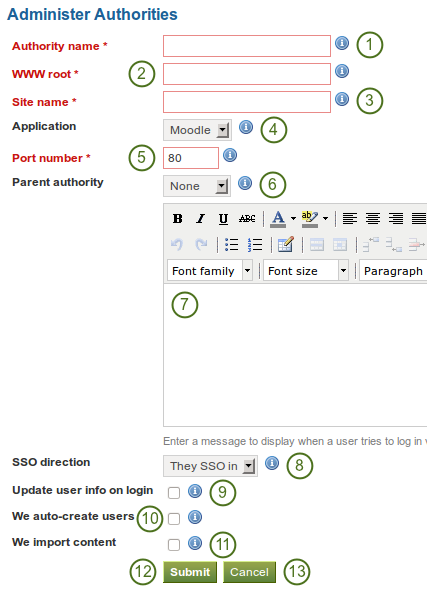 They SSO in: Enable this option to allow users from the remote site to roam to your Mahara site without having to enter their username and password. If you choose a Parent authority, ensure that all the users are associated with this authentication method instead of the MNet one. Otherwise, they will not be able to log in via the other authentication method. If the remote username for MNet and the other authentication method is already the same, you just need to change the authentication method. If they are not yet the same, you need to go update the user details together with changing their authentication method. Users can ask to join an institution on their institution membership page. Add the users by clicking on the right-arrow button . Alternatively, if you wish to decline users membership, you can select them and then send a general denial by clicking on the Decline requests button. When you have all the members you wish to invite / add to the institution, click the Invite users button. The users receive a notification and can accept or decline the institution membership invitation. Alternatively, you can click the Add members button as site admin and add users directly to the institution without asking them first. 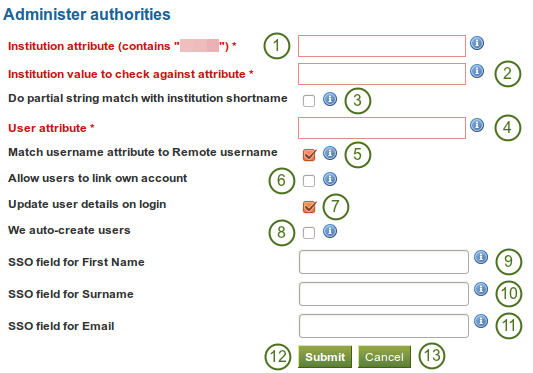 A site admin can filter users by the previous institution to which they were attached in order to find them more quickly. Users to display: Choose People who have left a given institution. “Left” is interpreted loosely, it also means when an institution administrator removed them from his institution. Add the users to the list Users to be removed by clicking on the right-arrow button . A site admin can uninvite users from an institution. Add the users to the list Users to be uninvited by clicking on the right-arrow button . Add the users to the list Institution Staff by clicking on the right-arrow button . You can give users admin rights in an institution in which they are members. The administrator role will allow them to manage users in their own institution. This page allows you to do that in bulk for many users at once. Search: If you have a lot of institution pages, you can search for a particular one by searching for it. You can search in the title, description and tags or only in tags. You can see a list of all institution pages for a specific institution. Institution: Select the institution from the drop-down menu for which you want to see the institution pages. Access list: View the access permissions for the pages. Click on the Edit access button to change the permissions of who can view and copy a page. Click the Secret URL edit button to define a secret URL for a page. Sharing an institution page is very similar to sharing a portfolio page. The only difference is that you can allow new institution members to receive a copy of an institution page immediately upon joining the institution. 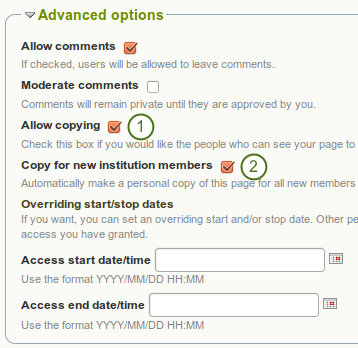 When you clicked on the Edit access button on the Share page for institution pages, click on the check box Allow copying under Advanced options. Once you have put a check mark into that box, the line Copy for new institution members will appear and you can place a check mark into that box if you wish all new institution members to receive that page automatically. The files area in an institution holds all files that are uploaded by institution administrators as institution files. The uploading process works like the one in the personal files area. The fields for email, first and last name can appear in a different order if you have chosen to the advanced spam protection settings. 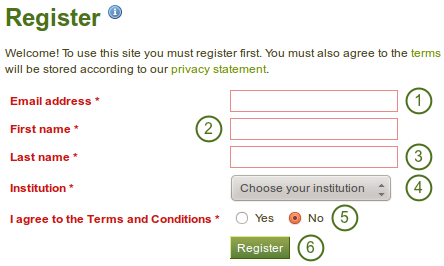 Institution: Select the institution for which you want to register. 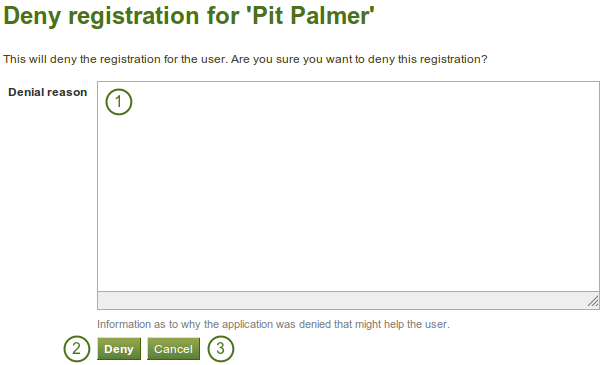 Click the Register button to be taken to the registration reason. Registration reason: You must provide a reason why you want to join this institution. Click the Complete registration button to receive an email to verify your email address. 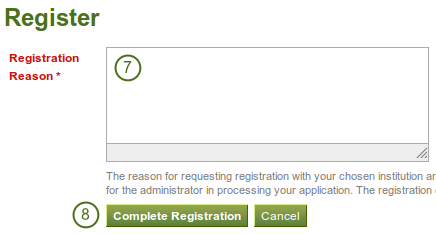 Or click the Cancel button to abort your registration. The administrators of that institution and the site administrator receive a notification about the pending registration. As site administrator, you can view pending registrations for all institutions on the Pending registrations page in Site administration → Institutions → Pending registrations. Write your reason for denying institution membership that might help the person to know why you do not want to give them access.